Most of the time inspiration finds us in one of those how-did-I-not-think-of-this-before ways. It occurred to me recently that almost every culture boasts such an array of cookies, biscuits and tarts, but so few of those sweet treats ever see the outside of a baking tray when they could be transformed into a show-stopping cake. The Hertzoggie is one of those quintessentially South African mignardises; firmly rooted in our heritage (it’s just a few years shy of its centenary), and it’s enjoyed by most South Africans. But a recipe never survives because of its cultural significance. When it’s just so damn good, it’s immortal! And I for one think it’s about time the Hertzoggie became a show-stopping cake. The story behind the Hertzoggie always makes me smile because it’s such a perfect example of how food can play just as powerful a role in society as art. Back in 1924, when South Africa was still under Crown rule, JBM Hertzog made a twofold promise that would see him voted in as prime minister. One, he would give women equal voting rights and two, he would extend those rights to the coloured community at the time. In celebration, the Cape-Malays created a jam-filled, coconut-and-meringue-crowned tartlet in his honour, and even named it after him. Sadly, Hertzog only made good on the first part of his promise. In response, the community promptly revisited the snow-capped Hertzoggie, replacing the coconut topping with two-toned pink and brown icing. They called their new creation the twee gevreetjie (hypocrite), and both mignardises are still enjoyed in the Cape today during the Muslim festival of Eid. 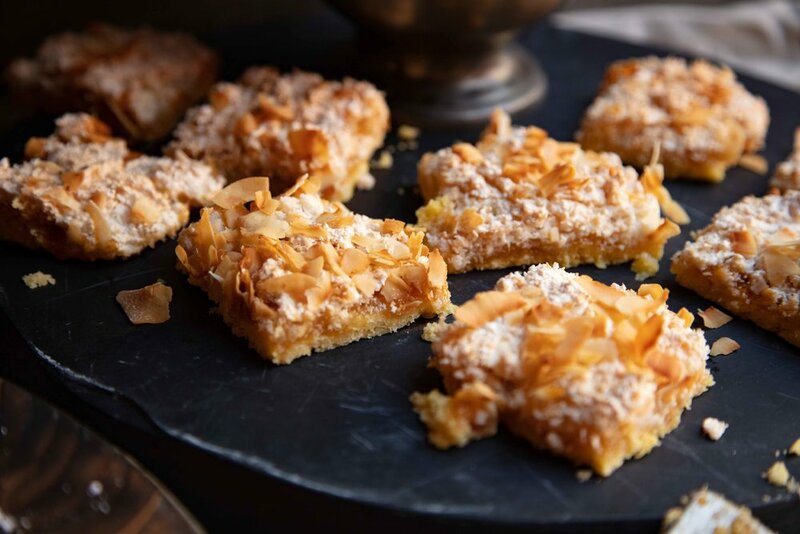 The Hertzoggie was such a hit that over the last century, is has become one of South Africa’s top teatime treats - no matter where you’re from. These jammy, coconutty morsels were the go-to “tea cookie” at our house when my mother and grandmothers were expecting company at short notice. My grandmother seldom made the classic tartlet version, though. “Hertzoggie squares,” she said, “are just as good, if not better. And so much more discreet, because it’s not as obvious when someone sneaks in an extra one when they think no one’s looking.” Since then, I’ve only ever made this version. We all deserve a shortcut: no rolling out the pastry, no letting it rest in the fridge overnight, just press it out onto the baking tray, smother it in apricot jam, whip up some coconut meringue and pop it in the oven. But what I love most about these Hertzoggies is that you lose count after eating the third one. Preheat the oven to 160 °C. Place the flour, baking powder, salt and butter in a food processor. Pulse until the butter has mixed with the flour. Add the caster sugar, egg yolks and water, and mix until a dough forms. Line a 35 x 25 x 2 cm baking tray with baking paper. Press the dough out evenly onto the tray and spread the jam liberally over the dough. Beat the egg whites until stiff peaks form. Add the sugar, one dessert spoon at a time. Continue beating for 3 – 4 seconds between additions. When ready, the mixture should be thick and glossy. Fold the coconut in and spoon the mixture onto of the jam layer. Spread it out evenly and sprinkle coconut flakes over the meringue mixture. Place the tray in oven and bake for 35 – 40 minutes. Remove it from the oven and cut the sheet into squares while it’s still hot. Let it cool completely before removing it from baking the baking tray. Store in airtight container. As easy as this Hertzoggie square recipe is to execute, ironically, the Hertzog Cake is even easier. Whenever I need to whip up a quick sponge cake, this is my no-frills, no-fail recipe. If you stick to the order of the ingredients, you literally can’t go wrong. Just mix them all together into a golden batter. This mixture is for a two-layer cake. To make four layers, don’t double up the ingredients, rather bake it in two batches. You’ll have better results. Because you’re mixing all the ingredients in one go, if you double the recipe, you risk over-mixing the batter (trust me on this one), which will result in a denser cake. You want it light and fluffy. Preheat the oven to 180 °C. Line the bases of two 18 cm cake tins with baking paper and spray with non-stick food spray. The next step is very important: add the ingredients in the exact order as they appear on the ingredients list to you bowl or electric beater, like a KitchenAid Artisan Mixer. First the eggs, then the vanilla, milk, and finally, sugar. Sieve the flour, baking powder and salt into the bowl. Lastly, drop in the soft butter. Using the k-beater, mix all the ingredients for 2 minutes. Divide the mixture between the cake tins and place them in the oven. Bake for 25 – 30 minute. Take the cakes out of the oven and carefully remove them from the tins. Then, let them cool. Repeat the process if you are baking a four-layer cake. Beat the egg whites until they form stiff peaks. Add the sugar one dessert spoon at a time. Continue beating for 3 – 4 seconds between additions. When ready, the mixture should be thick and glossy. Fold in the coconut. Reduce the heat of the oven to 160 °C. Spoon the meringue mixture into a circle on a lined baking tray and place it in the oven. Bake for 30 minutes. Then, take it out and let it cool. Coat each layer of the cake with jam, and don’t forget to coat the sided while you’re at it. The Hertzog should glisten. Place the icing sugar on a work surface and roll the cake across it on its side. Cover the top of the cake in a thin layer of jam and crown it with broken-up pieces of coconut meringue.